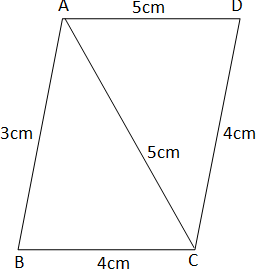 Q1: A park, in the shape of a quadrilateral ABCD, has ∠ C = 90º, AB = 9 m, BC = 12 m, CD = 5 m and AD = 8 m. How much area does it occupy? Solution: Let us join BD. 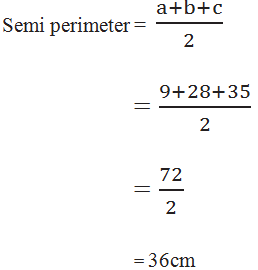 Q2: Find the area of a quadrilateral ABCD in which AB = 3 cm, BC = 4 cm, CD = 4 cm, DA = 5 cm and AC = 5 cm. 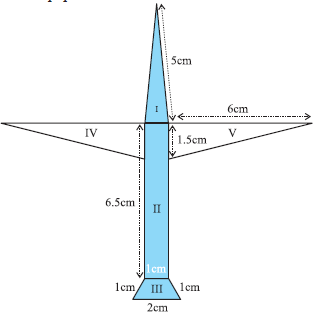 Q3: Radha made a picture of an aero plane with colored papers as shown in the given figure. 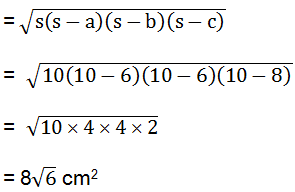 Find the total area of the paper used. This triangle is an isosceles triangle. 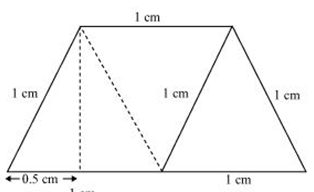 Q4: A triangle and a parallelogram have the same base and the same area. If the sides of the triangle are 26 cm, 28 cm and 30 cm, and the parallelogram stands on the base 28 cm, find the height of the parallelogram. Here, Sides of triangle be A, B, C.
area of grass field will each cow be getting? 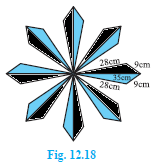 Q6: An umbrella is made by stitching 10 triangular pieces of cloth of two Different colors (see Fig.12.16), each piece measuring 20 cm, 50 cm and 50 cm. 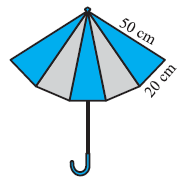 How much cloth of each color is required for the umbrella? There are 5 colors in umbrella. 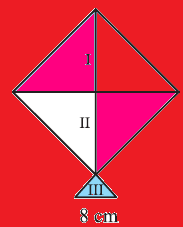 Q7: A kite in the shape of a square with a diagonal 32 cm and an isosceles triangle of base 8 cm and sides 6 cm each is to be made of three different shades as shown in Fig. 12.17. How much paper of each shade has been used in it? 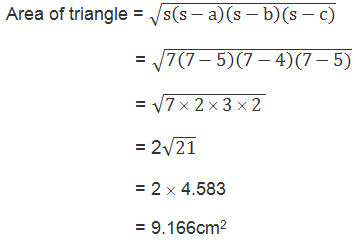 As the diagonal of the square bisect each other at right angle. Q8: A floral design on a floor is made up of 16 tiles which are triangular, the sides of the triangle being 9 cm, 28 cm and 35 cm (see Fig. 12.18). Find the cost of polishing the tiles at the rate of 50p per cm2. Cost of polishing the tiles at the rate of 50p per cm2. 9. A field is in the shape of a trapezium whose parallel sides are 25 m and10 m. The non-parallel sides are 14 m and 13 m. find the area of the field. 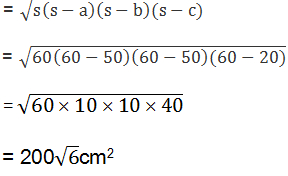 Solution: Let ABCD be the given trapezium with parallel sides AB = 25m and CD = 10m and the non-parallel sides AD = 13m and BC = 14m.